It’s been quite a few days for West Ham United midfielder Dimitri Payet. After creating one and scoring two goals to help see off Blackburn 5-1 in the FA Cup, Hammers boss Slaven Bilic compared Payet to Real Madrid’s Luka Modric. Now comparisons are being drawn to another Los Blancos star, this time it’s Welshman Gareth Bale. West Ham defender James Collins reportedly stated that he has never “played with or against anyone better”, which would include his fellow Wales international Bale. Payet cost West Ham £10.7m and is fast looking like the best buy of the season. In just 19 league appearances this season, the French international has made an impressive 67 chances. The majority of those chances have come in the form of key passes, averaging 3.3 per game. Bale cost Real Madrid a reported world record fee of £86m in 2013. Oulala’s stats show that this season he has created 38 chances in 15 league games. 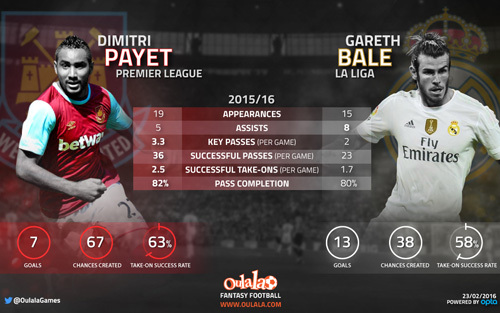 Although Bale has played four games less, that is still 29 fewer opportunities than Payet. Bale has averaged just 1.7 key passes per game. However, the Welshman has registered more assists than Payet (8 to 5). In terms of league goals, Bale is ahead with 13 to Payet’s seven. Bale has not played for Madrid in five league games due to an injury suffered in January. Payet also suffered an injury this season which kept him out for seven consecutive league games. Since his return he has scored two league goals and made two assists in seven games. Unlike most foreign players coming into the Premier League, Payet has quickly adapted to the pace and strength of the league and seems to fit right in.